The best place to start your Croatia island hopping adventure is in the very south of the country, in Dubrovnik, a city that is famous for its starring role in Game of Thrones and countless insta-famous snaps. The city is full of beautiful marble streets, baroque stone buildings, and ancient city walls that back right into the Adriatic sea. Though the city itself isn’t too big, it is served by an international airport with many connections to the rest of Europe, so it’s very easy to fly into. Don’t rent a car just yet, you can get around Dubrovnik easily on foot and the occasional taxi, and it’s best not to deal with parking in its tight streets. I really like Lapad Peninsula as a place to base yourself in Dubrovnik. It’s the suburb peninsula of Dubrovnik’s old town, and you can reach it by walking from the old town (a bit long, but pleasant) or an easy bus or taxi ride. This part of town is quiet and calm, with lovely beaches and restaurants, and it’s a good place to avoid tourist crowds. Boutique Hotel More is a favorite, as is Hotel Dubrovnik Palace. Also be sure to check out airbnb, there’s a wealth of options on Lapad. Hang around Lapad Peninsula and explore the beaches which are never more than a short walk away. I really love Vis beach, a pebble beach which is best for renting kayaks with which you can kayak to other beaches in the bay. Devote this day to exploring Dubrovnik’s picturesque old town. Start at Pile Gate, then make your way down Stradun Street, the central promenade of the city, and also be sure to walk along the City Walls, the iconic symbol of the city with a system of forts, bastions, towers and casemates. If you’re a Game of Thrones fan, you’ll definitely spot some familiar sights. One of my favorite places to eat in Dubrovnik is the Cafe Bar Buza, the literal definition of a hole-in-the-wall restaurant; it is nestled on the side of a cliff, with amazing views of the sea. It’s a great place to enjoy the sunset with a drink. You came to Croatia to island hop, right? Well it’s finally time to do just that. Just off the coast of Dubrovnik, you’ll find the Elaphiti Islands, a chain of islands that are often described as a hidden paradise. There are regular tourist ferries that go to the main islands (Kolucep, Lopud and Sipan), but the best and only way to experience these islands and avoid the crowds is on a private boat. This way you’ll get to experience both sand and pebble beaches, cliffs, seaside caves, pine forests, olive groves, orange and lemon orchards, as well as exotic gardens. A private boat will typically run between 300-500€ for the day (total, for your whole group). If you prefer to do the excursion by sailboat, I highly recommend working with Dubrovnik Daily Sailing. Otherwise, a speedboat is generally more affordable, and faster, and in that case Loren from Dubrovnik Explore is your best bet. Hvar is known as the sunniest and swankiest spot in all of Croatia, and it’s definitely the country’s most luxurious (and arguably beautiful) beach destination. The island is dotted with countless spectacular beach coves, vast fields of lavender, ancient olive trees, and vineyards that are experiencing a renaissance of their own. The food here is delicious and cutting edge, and the scenery is nothing short of perfect as the next Croatia island hopping destination. Hvar town is the center of the action, with its lively and action packed yet accessible city center and port, and countless ancient and historic landmarks. It’s popular among day trippers, so spending a night here guarantees you some peace and quiet. The restaurant scene here is also lively and fun, and if you want to explore nightlife in Croatia, this is one of the best places to do so. I usually recommend clients stay in an airbnb apartment, with many great places to choose from. Otherwise Little Green Bay is a great secluded hotel on a tiny bay away from the action, while Hotel Adriana provides a mid-range hotel experience in the center of Hvar town. Explore Hvar town and the beautiful Spanjola Fortress, as well as St Stephen’s Cathedral and square. Make sure to check out Falko Beach Bar and Divino restaurant. Drive through the island and make stops at the countless secluded bays for swimming and exploring (my favorites: Zavala beach, Dubovica beach and every single one of the Gdinj Bays). Hit the seas again, this time on a private boat (I recommend going through Mario Rent; starts at 350€ for the day, for 4 people). Use the luxury of a private boat for the day to make your way to Bisevo Island, home of the famous blue and green water caves, snorkel off the coast of stunning Budikovac Island, and make a stop at famed Vis island, a mysterious, bohemian island that is the furthest from mainland Croatia. The second largest city in the country, Split was built around the Roman Palace of the Emperor Diocletian. Though the city is one of the oldest in Croatia, it is also one of the most vibrant contemporary cities in the country. Its charm relies heavily on being the perfect blend of the old and the new, evidenced by its historic and ancient sites mingled with the many cafes, bars, shops and lively markets – all within the walls of this ancient city. With a population of 170,000 and sizzling with energy and ebullience, Split is often referred to as the “Mediterranean Flower” because of its beauty. Croatia island hopping is quite simple due to the frequent ferry service connects Stari Grad port in Hvar to Split (make sure to reserve crossing tickets in advance and show up at least an hour before scheduled departure time; in the high season, these ferries fill up fast). The ferry crossing takes about 2 hours. If you want to kill time while you wait for the ferry at the port, a good place to do so is Fast Food Klarita; no culinary masterpiece, but decent food and good WiFi. One day is the perfect amount of time to spend in Split- so if you wake up in Hvar, take the ferry across to Split in the morning and spend the second half of the day in Split. Make sure to check out Diocletian’s Palace, one of the most imposing Roman ruins in the world, and the old town, with its narrow streets and courtyards. A stop at Peristyle, once the entry hall of the Palace and now an architectural gem, is also a must. The Riva, Split’s promenade, is the center of social life for locals and a great place to stroll through at sunset. I’m a firm believer in saving the best for last, and just off the coast of Zadar, Dugi Otok island is sure to impress. It gives the feeling of being completely lost in time, somehow maintaining its relatively untouched beauty. The island is about 20 miles long and is marked by steep hills and cliffs, as well as vineyards, orchards and sheep pastures. The island is also surrounded by pebble and rock coves ideal for swimming and relaxing. You’ll want to have your car with you in Dugi Otok, and the best way to get there is by ferry from Zadar (the ferry ride itself takes a little over an hour, and Zadar is a 2 hour drive from Split). Zadar is also a lovely town, so if you’ve got a day to spare, definitely plan to spend it in Zadar. Though Sali is Dugi Otok’s largest town, I prefer Bozava town as base on the island. It has a tiny little harbor that has slowly grown from a fishing village to a vacation resort world over a few generations. Bozava is overgrown with beautiful, lush, flowering trees and is all around lovely. Hotel Maxim is best if you want smart luxury, otherwise Lavanda Hotel is also a great option. 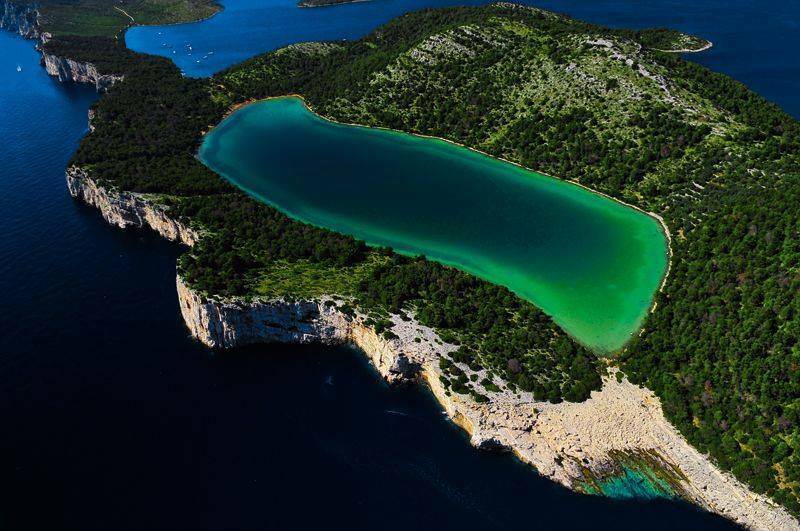 Though you can certainly criss-cross Dugi Otok in one day, I recommend spending two days here to get the maximum enjoyment out of it; it’s your vacation, after all. Take advantage of your first day in the area by lazing on Sakarun beach, what I consider to be the most beautiful and untouched beach in all of Croatia. The sea here looks more like the Caribbean, with its intense turquoise-blue coloring, and it is surrounded by an arch of smooth white stone, which backs into pinewoods. Make sure to also check out Veli Rat town, a pretty village with a marina on a sheltered bay and of course Sali, the island’s largest town. Spend the day in Telascica Nature Park, home of towering sea-side cliffs and six small islets that are completely unspoiled. If you venture far enough, you’ll find the remains of a Roman storage complex, and on the very southern side is Mir Lake, a saltwater lake fed by underground channels that is surrounded by pine forests. The water is of spa-like temperatures, and the mud is supposedly very good for your skin. Again, I recommend going the route of a private boat and skipper so you can set your own itinerary for the day; Tome is a great option, with daily rates of 200€. The lakes and waterfalls of this Croatian national park are absolutely stunning, and a visit here is definitely worth it. Plan for a whole day (it’s a 1.5 hour drive from Zadar) and make sure to choose a hiking route that includes both the upper and lower lakes; I’m particularly fond of Trail K.
Croatia’s northern peninsula, Istria is the largest peninsula in the Adriatic sea, with a rich culture and history spanning centuries. Istria is often called Croatia’s little Italy. Today, it’s known for a thriving culinary scene, and the most charming hillside towns that are similar to Tuscany’s, or even better. A day is enough to circle the peninsula, and you can base yourself in Opatija. Make sure to eat at Agroturizam Tončić, a remote restaurant that takes the concept of farm-to-table to a whole new level.